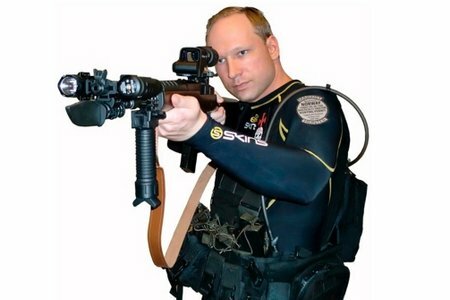 Anders Breivik a pathetic Islamophobe who simply could not get used to the fact that not all Norwegians were named OLAF any more. A sad,broken narcissist,replete with military insignia convinced he was saving “Christian” Europe from the Muslim hordes. Every country sports these fundamentalists , shattered by the new world and looking for a pure, uncontaminated abode to live in. Norway had gone to the dogs.Canada may be next in the Muslim takeover.What horseshit.How many Muslims do they know? These fundamentalists come in many stripes. Unable to deal with modernity and a world shattered largely by right wing economic greedsters, Ayn Rand disciples like Greenspan and Friedman, they do not know where to turn to assuage their confusion and anger.The brown people will do as handy scapegoats if you please. Catholicism is rife with these fundamentalists.Convinced that the centre is not holding, they grab on to the barque of Peter and engage in popolatry so they will not have to think anymore. They are unable to cope with any anbiguity, any whiff of pluralism, a multi hued world etc. In the middle are the confused and confusing surfers of the Internet hoping to find some wisdom they are unable to find in religion.And thy pass on to unsuspecting friends Islamophobisc rants, not too distant from the racist antisemitism of 50 years ago. Maybe this will give them pause from forwarding such demeaning crap about the vast majority of Muslims. What has happened to the world we knew, where everybody in Toronto looked like McNeil.It must be the Muslims. And into the confusion steps people like MacLean’s Mark Steyn and the Murdoch papers so quick like Fox news to quickly assume another Al Qaida maniac was loose this time in Norway. Wrong.More like that ex-altar boy Timothy McVeigh. Christian? Enough to make the nonviolent one weep. Can there be any public figure more pathetic than Tony Blair? Like Clinton, he will come and speak to your group for $100,000 and up. Shamed over kissing American culo over Iraq, he is now outed in the Murdoch scandal.It is reported his first trip on winning the premiership was to hike off to Australia to genuflect to the Dirty Digger. Murdoch, a man totally devoid of principle, never cared what party he bought and Labour was just fine with him. He who pays the piper etc and Murdoch managed with Blair to turn the Labour Party into the mushy middle like Clinton’s Democrats. Money as we know corrupts everything. Perhaps the greatest joke of Blair’s pathetic “international statesman” role was that of Middle East envoy, in fact only Washington’s envoy in this boiling cauldron of festering injustice to the Palestinians. The craven Blair was nothing more than a shill for Israel, almost as bad as Canada’s Stephen Harper. The wall itself follows no practical border, but instead, gerrymanders in such a way that it seals off the most Palestinians in the smallest possible area. One area of the wall speaks to the ridiculousness of the route, where the stone surrounds a Palestinian home on three sides. The house, also a pair of shops, is home to two families. Their front doors open onto what used to be the main street. Now, the only view is the graffiti on the wall and the puzzled looks of tourists as they wonder what dead end they’ve come to. But inside one store, thirteen year old Danny and twenty-two year old Christine happily run back and forth inside the small shop, checking prices, selling hand-carved figurines, postcards and garments. They have adapted to the suppression and in many ways, risen higher than the walls that encircle them. 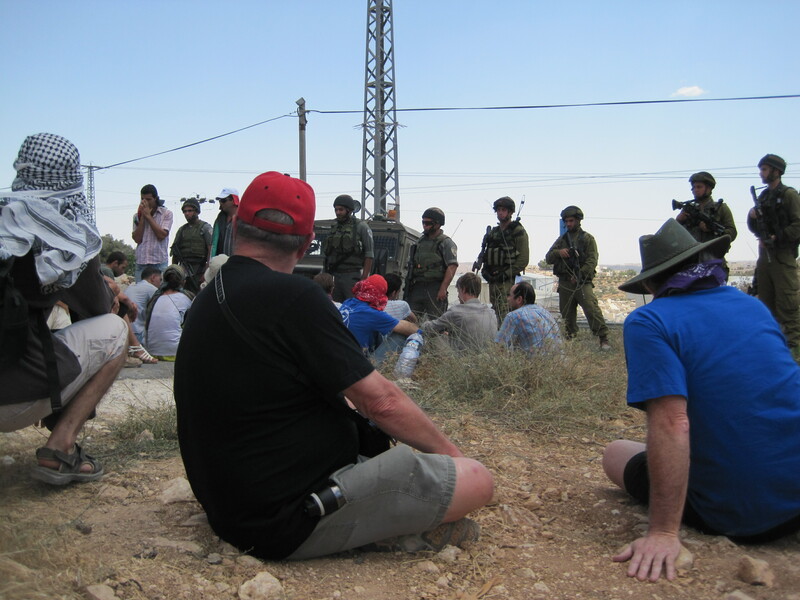 The group walked through Ida Camp and made their way through the same checkpoint that every day, thousands of Palestinians must go through to get into Israel, a humiliating stretch of crowded walkways where the guide rails look like the paths of a cattle pen. 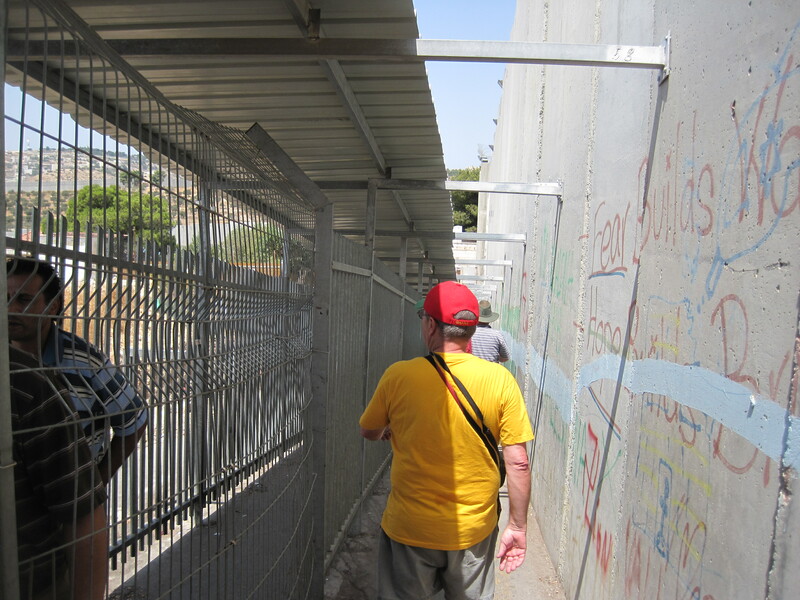 After snaking our way through the metal maze and passing through turnstiles, one by one, we approached heavy bullet-proof glass where Israeli troops waved us through a metal detector while our belongings went through an X-ray machine. Above us, on catwalks, guards armed with machine guns patrolled, scanning the Palestinians below. Children looked up but were not surprised by what they saw. This was just another day for them. After making it through the checkpoints, which took the group 37 minutes (one-third the time it normally takes since it was not the early morning when thousands head to work), we headed North on the bus to Galilee. It was a solemn, sad drive for most. We watched the streets become cleaner, the store fronts become more elegant, and an entire society ignoring one of the most atrocious violations of human rights of the Twenty-first Century. The two hour drive brought a change in elevation, terrain and vegetation. We watched the desert bloom, as Date Palm farms and lush greenery burst by the windows, and finally arriving in the city of Nazareth, we found a bustling city-center. Besides the legal battles, Israel has used several other strategies to get them off the land. The road to their farm has been blockaded. They are granted no permits for construction, so they utilize caves and tents. Even the tents have demolition orders from the Israeli army. Israeli settlers have uprooted 350 of their olive trees. The nearby Israeli settlement has abundant water – enough for a swimming pool – while rain collected in cisterns is the only source of water on the farm. The Israeli settlement has electricity 24/7 but Israel will not permit the farm to be connected to the grid. And poor Michael Ignatieff fell under the tide as did other notable scriveners like Richard Gwyn of the Star. When the moment of the Iraq War arose these men for whatever reason—career usually, chummy next to power—who knows.There was no moral cente which should have steered them away from war —always a defeat for humanity—as JP ll so wisely opined. These men had never lived war nor did the cheerleaders like Cheney,Wolfowitz, so quick to send the poor to die in imperial wars. Ignatieff totally missed the moment when great men risk their displeasure of the emperor and the craven opinion makers.They came down on the side of emperor and empire. Ignatieff never recovered.There was little to choose between him and Harper—also a cheerleader for war.We knew that of Harper, an empire lover from the beginning but Iggy was supposed to be a public intellectual, a man who should have devoted himself to peace and the common good. In the end, he was a sad hack, content to bow to power. mad dog barking at the Dutch judge. by Slobodan Milosevic 20 years ago.